Sam and Barbra are sick of their draughty, damp, cold home. As every sucker knows, damp mostly resides in the windows! Well, the good news for Sam and Barbra is that they can call NOW to get their FREE NO OBLIGATION quote NOW, if they call NOW, on a number shouted by a white guy in a cheap suit, NOW. And so can you! Fill that hole in the living room wall! Enable your children to jump blissfully on the bed with only minimal risk of falling out the window! Fill your home with cheerful tshirt-wearing bit actors who only just know which end of the screwdriver to hold, FOR A LIMITED TIME ONLY! If you were alive and paying attention in the UK about 15 years ago, that wall of confusing hyperbole will be all too familiar! 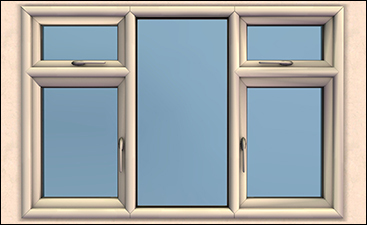 While I really don't miss the SafeStyle ads, it's always struck me as odd that EA never made any regular, boring, UPVC windows for sims. And now that I'm building tonnes of suburban houses, I really can't keep going without them. So here they are! This set consists of six matching windows, plus counterheight and centred versions of each, ranging in size from one tile up to four tiles wide. Something for every room! You can click the thumbnails in the table below to zoom in on the images. 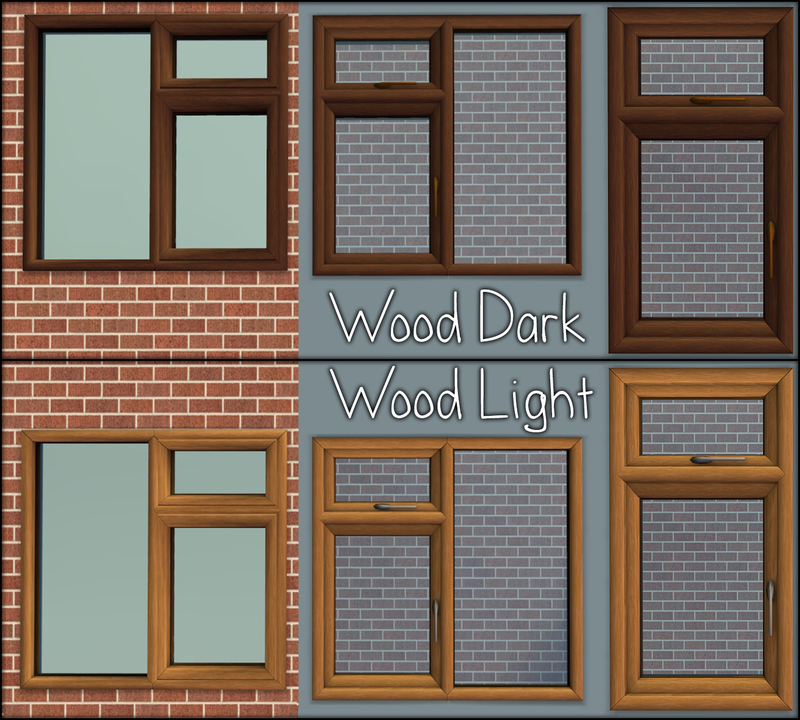 The white texture shown in the images above is the default texture; also included are four recolours, pictured above, in light and dark brown, with or without wood effect. The entire set is slaved to the regular height 2 tile window. If you want to recolour this set, recolour the regular height 2 tile window. If you delete the mesh for the regular height 2 tile window, the set will stop working. I've UV mapped the set so it's extremely easy to recolour. If you get stuck, I suggest downloading the grouped MS3D mesh from the Files tab and taking a look at the mapping yourself. zookini for the 4 tile window I cloned, and a variety of people including IgnorantBliss, Numenor and cmomoney for their techniques and tutorials. Free No Obligation Windows - Full Set.7z | Description: Everything you need! Download this if you want the whole set. Free No Obligation Windows - Regular Height.7z | Description: Just the regular height meshes, no retextures. Free No Obligation Windows - Counterheight + Master.7z | Description: Just the counterheight and master meshes, no retextures. 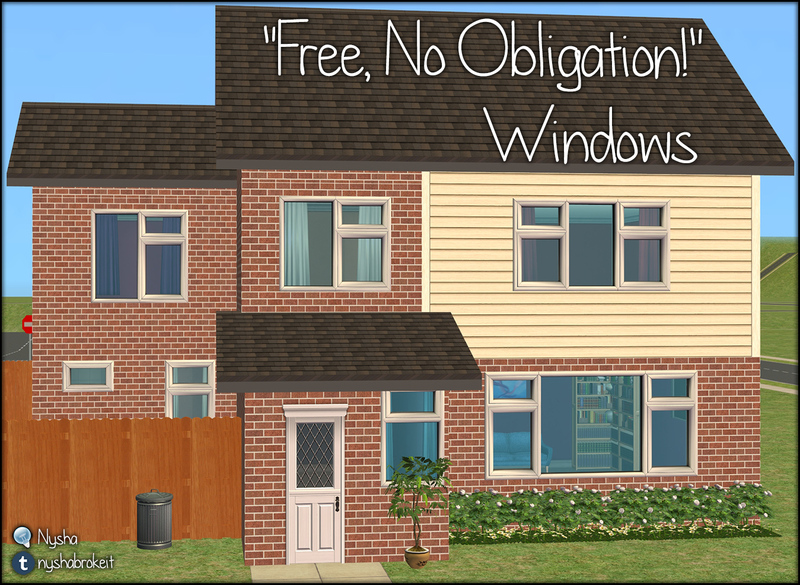 Free No Obligation Windows - Flat & Wood Recolours.7z | Description: Just the retextures, no meshes. Grouped meshes + texture PSD.7z | Description: Grouped MS3D master mesh and texture PSD, for retexturing or making add-ons.